Philadelphia's #1 Virtual Reality Rental Co.
Want to bring VR to your next Philadelphia event? We will make it easy & ensure your guests have a blast. We've worked with the likes of Twitter, GE, & Macy's. Easily book virtual reality for your next event in Philadelphia, pa. We have the best equipment, customer service, and virtual reality experiences. Do you want to wow your guests? Do you want them to talk about how awesome your event was the next day, week, or month? If you answered yes, then you're going to need to offer your guests something new, creative, interesting, and fun. That's where virtual reality (VR) comes in. Virtual reality (VR) is the hottest new technology and it delivers a new, fun, relevant, and interesting experience to all types of events. If you're not sure how renting virtual reality (VR) for your next Philadelphia event would work or you want to talk specifics contact us and we will be happy to help. The City of Brotherly Love features a wide array of locations to visit, including the over 1,000 acres of the Longwood Gardens, the nearly 1,300-animal Philadelphia Zoo, and The Franklin Institute, one of the oldest science museums in the country. Philadelphia, Pennsylvania, was also the first capitol of the United States, with its history forever intertwined in the birth of our nation. Residents of Philadelphia and visitors to the city can travel to Independence Hall where both the Declaration of Independence and the Constitution were born. Another favorite destination is the Liberty Bell Center, home to the world famous Liberty Bell, a symbol of American freedom. Those interested in sports can take in a game with one of the many Philadelphia teams, including the NFL’s Eagles, MLB’s Phillies, NBA’s 76ers, and NHL’s Flyers. To capture the attention of Philadelphia visitors and residents for your upcoming event, you'll need to go the extra mile. Start by relying on the experts at VirtualRealityRental.co to help you plan a one-of-a-kind experience with the latest in Virtual Reality (VR) technology, including the latest in VR games, videos, and more. Make your next event the best one yet by leveraging our VR expertise, from the planning stages to perfect execution. Contact us today, and we'll help you wow your guests with high-quality, fun-filled VR games, videos, and more. "My jaws dropped as I witnessed the beauty of the coral reef islands so closely. Almost felt like I could touch them. My senses were intoxicated. Wow! This was my first VR experience at a business event in Philadelphia." "Tried Google Daydream View at a sales conference in Philadelphia. This thing is so damn crazy. True to its name. I was day dreaming and it was such an exhilarating experience. Well done organizers." "Before trying VR I thought how people could be so silly to wear a head gear and believe what they saw! And, now after experiencing it at an event in Philadelphia…you can call me silly but I’m loving it." "I knew my teenage son was crazy about VR but I thought it was just his age to be overexcited! Hell, no…VR does drive you crazyyyy! After trying it at a business party, I was feeling excited like a teenage boy myself." "I keep telling my team that if you take stress out of work and start enjoying it, you’ll be unstoppable. 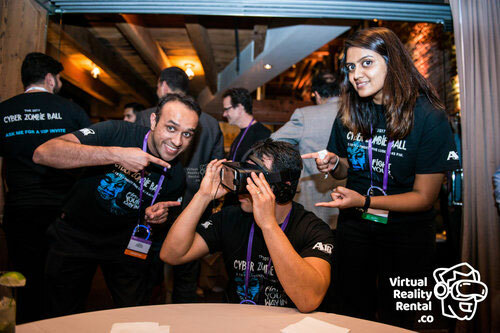 To make this a reality we included VR at our annual conference and guess what…the change in our team’s spirit was unbelievable." "I was at a company meet in Philadelphia and believe me I have never in my career seen such motivation among attendees. Everyone was happy trying VR, sharing ideas and discussing new things." For longer events, we suggest choosing a few different VR experiences so that guests have even more resaon to visit your space multiple times.